For years the world has followed Michael Phelps’s progress from teen sensation in Sydney to bona fide phenom in Athens. Now he’s a living Olympic legend with a peerless record of gold medals. In No Limits, Michael Phelps—the greatest competitor since Michael Jordan or Tiger Woods—will share the secrets to his remarkable success. Behind his tally of Olympic gold medals lies a consistent approach to competition, a determination to win, mental preparation, and a straightforward passion for his sport. One of his mottoes is “Performance is Reality,” and it typifies his attitude about swimming. Phelps shares remarkable anecdotes about family, his coach, his passion for the sport, and the wisdom that he has gained from unexpected challenges and obstacles. The road has not always been easy. When he was younger he was diagnosed with attention-deficit / hyperactivity disorder (ADHD); other kids bullied him; even a teacher said he would never be successful. Later, he had to work through injuries that jeopardized his career. Phelps explains how he has overcome these and other challenges and developed the mental attitudes that go into reaching any goals: perseverance, overcoming obstacles, believing in yourself, hard work, commitment, and sacrifice. 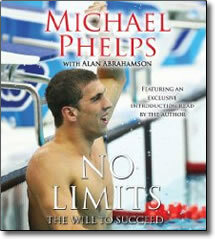 Phelps’s success is imbued with the perspective of overcoming obstacles and doing whatever it takes to realize a dream. As his coach, Bob Bowman, says, Phelps has made a habit out of things other people aren’t willing to do. No Limits will show readers just how he does that, and will inspire anyone to follow their passion straight to the finish line. Exploring the hard work, commitment, and sacrifice that go into reaching any goals, No Limits gives a behind-the-scenes look at the making of a real champion. It’s easy to get bogged down by doubt or to lose focus when a challenge seems out of reach, but Phelps believes that you can accomplish anything if you fully commit yourself to it. No Limits is a step-by-step guide to realizing one’s dream.